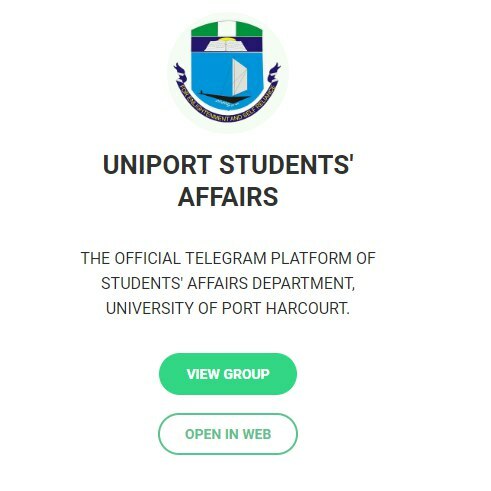 HERE ARE THE STEPS YOU CAN TAKE TO JOIN THE OFFICIAL TELEGRAM GROUP OF STUDENTS’ AFFAIRS IN UNIPORT. IF YOU HAVE TELEGRAM APP ON YOUR SMARTPHONE, JUST CLICK t.me/uniportdsa AND SELECT THE TELEGRAM ICON THAT MAY POP UP. IT WILL TAKE YOU TO THE GROUP DIRECTLY. 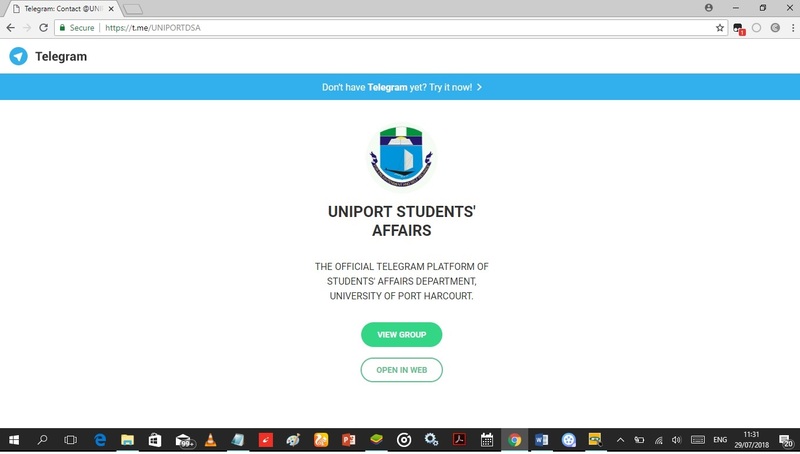 IF YOU DO NOT HAVE A SMARTPHONE, VISIT t.me/uniportdsa USING ANY WEB BROWSER, SELECT WEB AND SET UP YOUR TELEGRAM PROFILE THEN, JOIN THE GROUP. 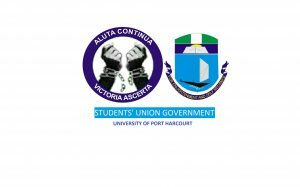 THIS IS AN OBLIGATION FOR EVERY FINAL YEAR STUDENT OF UNIPORT AS RELEVANT INFORMATION WILL BE PASSED ACROSS TO ALL THROUGH THAT CHANNEL. IT IS ALSO A MEDIUM FOR STUDENTS TO MAKE INQUIRIES AND INFORM THE STUDENTS’ AFFAIRS DEPARTMENT OF THEIR CHALLENGES AS WELL. NOT AN AVENUE FOR SPAM AND IRRELEVANT MESSAGES. STRICTLY OFFICIAL. Previous articleVelvetJobs: INCREASING YOUR CHANCES OF WORKING IN CORPORATE AMERICA.